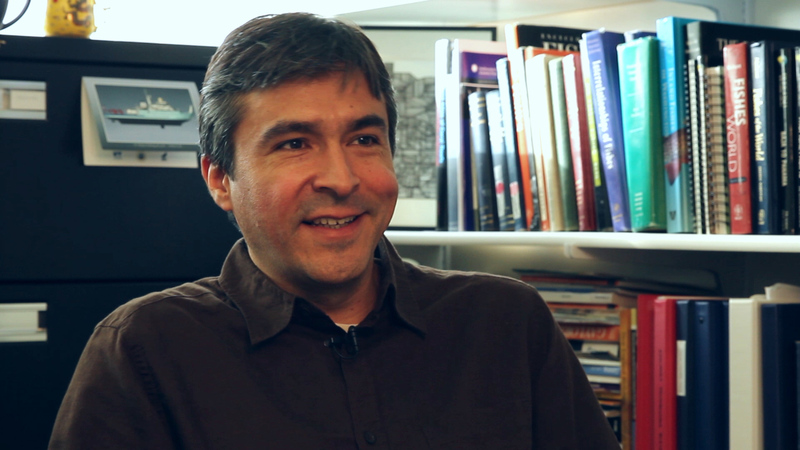 Recently we sat down with Andres Lopez, UAMN Curator of Fishes and guest curator for the exhibition, Arctic Odyssey. We asked him some questions about how he came to work on the exhibit, the differences between scientific research and exhibitions, and his expectations for the project. To start off, how’d you come to Fairbanks? “I am originally from Colombia but I have been in the U.S. for many, many years, since I started college, and through grad school. My undergraduate degree is a B.S. in biology, and I followed that with a master’s in fisheries and after that a PhD in ecology and evolutionary biology. It’s a mixture of lots of biologies but also always revolving around fish and aquatic systems. Why did you sign up for this great task of being guest curator for Arctic Odyssey? So it’s more about the general presentation of science rather than your own research? What has come out of the planning process that you didn’t expect? You’re involved in lots of projects that take months and years and even decades to do the research you want to do on a particular area or species. So working on a project that doesn’t necessarily take so long to get an idea and hone it down, what’s the experience been like for you? “Yeah, organic would be a good word, because there is much more creativity involved in coming up with things that will not only be technically accurate but will also be interesting. So that whole component of identifying things that will appeal to a broad audience, that actually connect well with the topics of the exhibit has been very enlightening in project development. Given that lots of people are on the team, obviously there are many different creative ideas that are sometimes in conflict with each other. So as the guest curator you’ve got to be the person to at some point say ‘this is the direction things need to go, this is the scope of the exhibit, and these ideas are secondary to these other ones. “And that’s a challenge, because obviously from my background I would tend to err on the side of making everything very technical and have a lot of information on complex ideas that may not really lend themselves to be deployed or shown in an exhibit. Given that the exhibit’s going to show you how the Sikuliaq works, in terms of the water and the ocean, there are a lot of cool, interesting things that people don’t think about. Could you touch on what you thought you knew about the water? “Oceans are familiar. There’s a lot of documentaries on oceans. People visit the ocean with some frequency. But in reality there’s a huge proportion of the ocean that we can’t get to and study up close without some specialized resources to be able to access them. “One of the things that we’ve learned in developing this exhibit is how vessels like the Sikuliaq allow researchers to get to places that are hard to investigate. And not just physically get to that location but also deploy instruments that allow them to get an idea of the conditions and the characteristics of the ocean at those locations. “These are ecosystems that are inaccessible by definition, they’re out there in the middle of the ocean at great depths, but they’re also very interesting from the perspective of how they integrate with water columns ecosystems, with terrestrial ecosystems over the long term, how they are involved with the cycling of key elements that maintain ecosystems throughout the planet.